Watermelons are warm season fruits that grow on sprawling vines. Due to their vining habit, watermelons need lots of room and are not very well suited to small garden spaces. Watermelons are long crops that require 80-100 days from seed to produce melons. They can be grown from either seed or transplants. 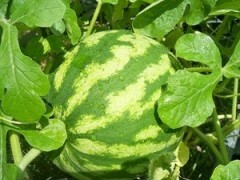 Transplants will produce watermelons 2 weeks earlier than compared to seed grown vines. I’m interested in a seed catalog. Can you please let me know back. thank you. There are some very good seed catalogs…my favorites are seedsavers.org and rareseeds.com. These are both heirloom seed catalogs. Good Luck.